If you’ve been looking at this photographer’s web site you know that I love working with architecture to create dramatic wedding photographs. Hailing from Long Island I often find myself working at most of Long Island’s iconic mansions. Oheka Castle, The Glen Cove Mansion, The deSeversky Mansion, The Royalton Mansion at Roslyn Country Club, The Vanderbilt Mansion, Coe Hall at Planting Fields Arboretum, The Bourne Mansion, Mill Neck Manor and the mansion at Old Westbury Gardens. All of these venues have their own individual design elements and offer incredible opportunities for amazing wedding photos. But deep in the heart of urban New York City you will find some of the most incredible architecture anywhere. NYC is home to some of the most legendary buildings anywhere on this planet. A case in point is the spot where this picture was taken...in front of the NYC Library building. 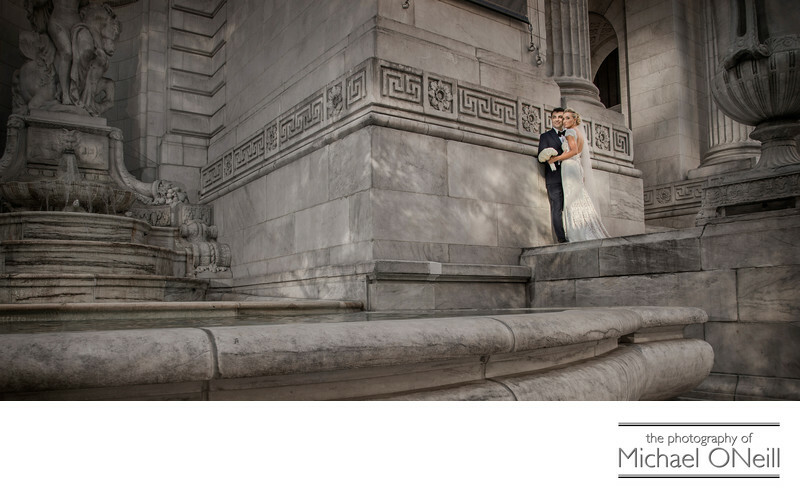 The dramatic stone architecture, massive sculptures, towering columns and soothing reflection pools provide the perfect backdrop for architecturally inspired wedding photography. There are literally dozens of spots around this one building that lend themselves to great photographs and there are dozens more buildings as impressive as this one at which to create awesome wedding photography. Though the logistics of getting around NYC for photographs can be challenging the rewards are surely worth the effort.